In recent years Gibson’s quality has slipped, and I have seen plenty of their guitars with crappy fretwork and bum necks, but most of the problem guitars have been Les Pauls. 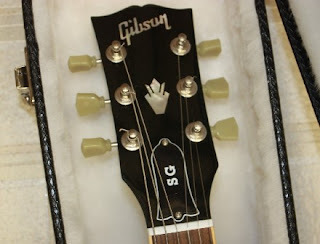 It is a crying shame that people continue to buy Gibsons for thousands of dollars that need fret jobs or fretboard planing right out of the box. I can only figure that most of them never get played very much. But the simpler and less expensive SG models usually have nice-playing necks, and thankfully this 2009 SG Standard is a good one! 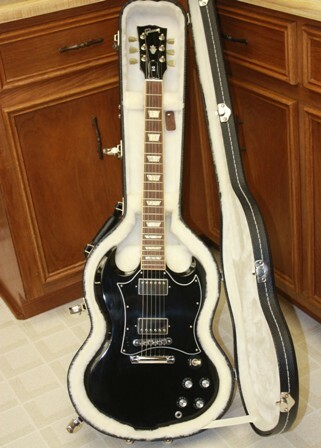 The Gibson SG is a classic guitar that was introduced in 1961 as a cheaper version of the Les Paul. It has not really changed much over the years, and to be honest I think they play a bit better (easier) than the Les Paul models. 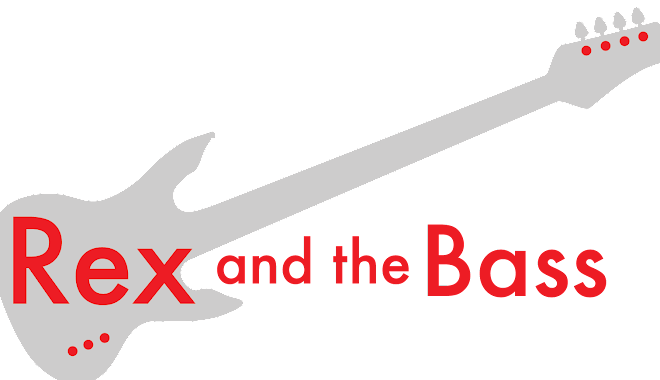 They have never been as popular as Les Pauls, and everybody thinks you want to be Angus Young or Tony Iommi when they see you playing one. This unmodified example is an SG Standard that was built at the Nashville factory in February of 2009, and is finished in glossy ebony over its mahogany body and neck. 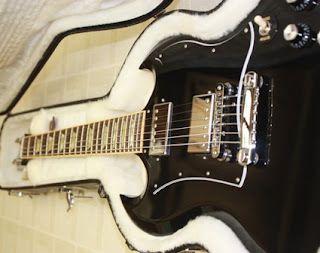 It has chrome hardware, including Gibson Deluxe tuners and a Tune-o-matic bridge with a stopbar tailpiece. The humbucker pickups are a 490R at the neck and a 498T at the bridge. 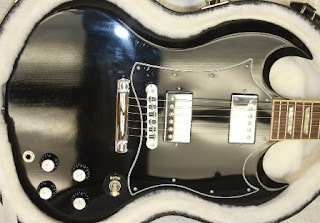 They are wired in the typical Les Paul fashion: two volume and two tone pots with a 3-way selector switch. As I said before, the neck is what makes this SG so good. It is a standard scale (24.75-inch) neck, with a bound rosewood fretboard and trapezoidal inlays. BTW, the only time I ever use the word “trapezoidal” is when I talk about Gibson guitars. Anyway, they got this one right. The fretboard is true, and the frets are dead nuts level. The fret edges are smooth as silk, and the action is low and buzz free. And lastly, this one comes in at around 7 pounds, 10 ounces. This is a real blessing for any of you out there that have grown used to heavy-assed Les Pauls. It almost feels like a toy in comparison to my 12 pound Les Paul Standard. The moral of this story is that there are still some good Gibsons out there, but you might have to extend your search beyond the sexier Les Paul models, and always try before you buy.